meeting to begin at 7:00 p.m. Friendship Circle, noon to 3:00 p.m.
Ordination of Michael Bruce, 7:30 p.m.
and will be held every Sunday. Parish Visioning Day, 9:00 a.m. to 4:00 p.m. Opening Service of Diocesan Synod. the Neil Bardal Concert Series will present a special concert in memory of Bishop Patrick and Mary Lee with proceeds going to support the Kalagali/Fisher Branch School in Uganda. The Friday morning Bible study group resumes on Friday, September 14, from 10:00 a.m. to noon. The Thursday evening Bible study, which meets from 7:00 to 8:00 p.m., will resume later in September. Watch this space for the date. And don’t forget The Dean’s Forum: Dusting off the Bible on Sunday mornings from 9:15 to 10:05, starting September 23. At its June meeting Vestry set the date for the Parish Visioning Day and it will be held from 9:00 a.m. to 4:00 p.m. on Saturday, October 13. Please mark your calendars and plan to attend this important day in the life of the Cathedral. It is important to hear from as many members of the congregation as possible as we set the course for the Cathedral over the next few years. In an effort to strengthen the choir in its ministry, I am taking the time this fall to interview and audition individual choristers. In the course of these discussions, I hope to solidify my understanding of members’ voices and their visions for the role of the choir, both for themselves and for our ministry to our faith community and in the Diocese. Also, from a very practical perspective we will seek to find a rehearsal schedule that fits members’ busy lives. Once these interviews have taken place, the choir will be formed. The Friendship Circle begins its weekly meetings this coming Thursday, with a brown-bag lunch at noon. It is a time for the women of the parish to come together to knit prayer shawls, pray together and be a sisterhood in Christ. Each meeting ends at 3:00 p.m. All are welcome. Please talk to Bunny McCormick for more information. After a two-year hiatus, the Trinity Institute Conference returns with a new format this November, and the Cathedral will be web casting the event once again. As yet, the Cathedral Corporation has not set the fee for attendance, so this notice is just a heads-up that the Conference will be back at the Cathedral (which was the first off-site centre to web cast the Trinity Conference in Canada!) The theme of this year’s conference is ‘Radical Christian Life: Equipping Ourselves for Social Change’. There will be only one speaker this year, but since that speaker is the gifted Sr. Joan Chittister OSB, ably assisted by a group of theologians, spiritual directors and Christian activists as workshop leaders, it will be, as always, a worthwhile event, Watch this space for more information in the coming weeks. Our sincere thanks to Ted Ash, Dennis Beaulieu,Tony Chen, Wallace Desmarais, Alan Firth and Brian Ford for their willing hands and gift of time to re-paint the John West Hall in time for today’s festive luncheon marking the Bicentenary of the arrival of the first group of Selkirk Settlers. Thanks, too, to Mavis Ford and Rene Jamieson for feeding the painting crew. On Wednesday, September 19 at 7:00 p.m., Bishop Donald will celebrate the inauguration of the new Trinity Anglican Ministry, and will install the Rev. Liz Richens (née McKendry) and the Rev. Michael Bruce as co-incumbents of the Ministry’s component Parishes of St. Anne, St. Barnabas and St. Martin-in-the-Fields. The service will be held at St. Barnabas, 730 McPhillips Street, at 7:00 p.m. All are welcome. The September meeting of Vestry will be held on Wednesday, September 12, rather than on the third Wednesday of the month, and it will begin at 6:00 p.m. with a potluck supper and Table Eucharist. On Tuesday, September 11, the S.M.A.R.T. exercise classes will resume at 10:00 a.m. in the John West Hall. S.M.A.R.T. is a low-impact program designed by the Victorian Order of Nurses to help keep those of us with aging bones and creaking joints in good shape, and it is delivered by trained instructors (two of whom are our own Gerry and Peter Spence). If you can’t make it on Tuesday, the class is also available on Friday mornings at 10:00 a.m., in the John West Hall. Canon Condo will be away from the Cathedral from November 28 to December 8, returning to work on December 9. In his absence, Canon Tony Harwood-Jones will be looking after pastoral emergencies. Canon Harwood-Jones may be contacted by calling the Cathedral Office at 586-8385. The reserved calendars are available at the back of the church. Please be sure to pick-up the one(s) with your name on the attached payment envelope. Please place your payment in the envelope and then on the offertory plate. Thank you for your order and enjoy! The closing date for applications for posting of Rector and Dean of the Cathedral was July 31. The Advisory Panel consisting of Bishop Don, Archdeacon Mawejje, Peter Moodie, June Rampersad and two members at large from the Diocese met and have made recommendations to the canonical committee. This committee will begin the interview process shortly. The Canonical Committee has started its work; two meetings were held,one with the Bishop, and another to organize the work details. The main task now is to prepare the parish profile as this document describes the parish to potential candidates. The Verger position is an honorarium based position with part time hours. St. Martin-in-the-Fields will host a Seder Supper with Holy Eucharist and Foot/Hand -Washing at 6:00 pm. Tickets are $10.00 to cover the cost of the meal and are available from Shirley Godfrey. 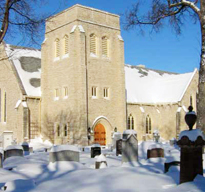 Seven Oaks Historical Society of Winnipeg Inc.
will hold their Annual General Meeting on April 26th, at 7:30 p.m. here at the Cathedral in the John West Hall. The Moderator will be Bruce Cherney, Editor of The Real Estate News. Everyone is welcome to attend! Cathedral members are reminded that a Prayer Circle operates from the Cathedral. The sewing of choir gown scapulas takes place in the choir room on Fridays at 9 a.m. Please join us if you are able to help out. Many hands make light work! St. Martin-in-the-Fields will host a Seder Supper with Holy Eucharist and Foot/Hand -Washing at 6:00 pm. Tickets are $10.00 to cover the cost of the meal and are available from Shirley Godfey.